Beaders always need beading needles! You may be thinking that we already have as many as we need, but that's never true. Especially since all needles are not created equal. Never underestimate the importance of a clean cut thread to a beader. At the beginning of a project, having a sharp, precisely cut llength of beading thread is easier to fit through a needle eye. When you are finishing your beadwork, there’s nothing better than knowing your thread end will not poke out of your beadwork. A nice pair of embroidery scissors can be the solution to both, although a thread burner is often the best solution to finishing your beadwork since it can seal the end of the thread as well as cutting the thread end. Either of these essential tools for beaders can be purchased for less than $20. What do beaders do when they're not beading? They read about beading! There are a couple of ways to give bead reading gifts. There are always new beadwork books released before the holidays, so scour bookstores or local bead stores for what's new. Or you can give the gift that keeps on giving! A gift subscription to a beading magazine. Either of these bead reading options won’t kill your budget, but it will give the lucky recipient beading knowledge, inspiration, articles and projects. You can find several beading or jewelry making magazines that cover a full range of interests and topics, from beadweaving and bead stringing to wire work and polymer clay. Bead and Button magazine, Jewelry Stringing, Step by Step Wire Jewelry are a few to consider. Are you worried your friend already subscribes to top bead magazines? Then consider ordering interesting past issues that they may have never seen before like this compilation issue Beadwork Presents 41 Favorite Jewelry Designs. Judging from the comments of people who have one, Bead On It Boards are one of the best beading work surfaces around. They have a non slip base, soft raised fabric sides with rounded corners that keep beads contained and also prevent your thread getting caught on corners. The beading surface is fabric covered and designed so the beads will sit hole side up. If they don't, supposedly they will turn if you shimmy your finger along the fabric near the beads. 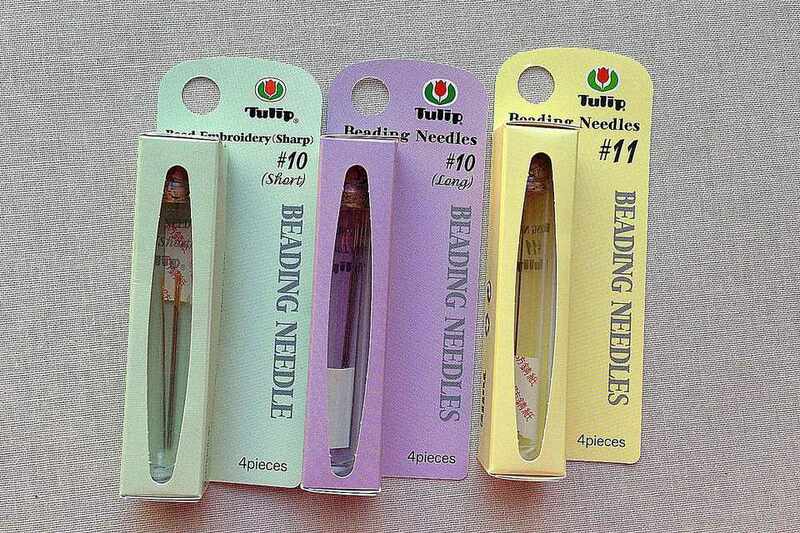 That makes them easier to pick up with your needle making beading faster. Ranging in price from $35 - $120, I think you can safely assume a beader who doesn't have one, would love one as a gift. But don't take my word for it, here's a blog post by Sam of Wescott Jewelry with her feelings on receiving a Bead On It Board as a gift. And while you're there, browse her beadwork designs and sign up for her newsletter. Maybe there will be one of these under the Christmas tree for me this year! If someone you know is interested in loom beading, there can be no other choice but the Mirrix Beading Loom. These looms are sturdy and a joy to use. Each loom comes with full setup instructions, and the Mirrix website is full of helpful tips and information. And they have the best customer service around. Mirrix looms are proudly manufactured in the USA. Two great choices to consider are the 8" Lani Loom, their most popular loom for bead weaving or the 16" Big Sister Loom, which is great for larger beaded wall-hanging type pieces or weaving multiple pieces at the same time. Mirrix looms are an investment, but they are versatile and high quality, a tool that you can use as a beginner and grow with. Mirrix looms can also be used as fiber tapestry looms without beads. The Mirrix web store offers a full line of kits, patterns and yarns, beads and fibers in case you want to pick up some goodies to go with the loom. There are so many bead and craft storage options that you are sure to find something gift-worthy. For some specific ideas, look at these best organization solutions for beaders. And don't limit yourself to the options specifically for beading. Wander down the scrapbooking aisle or even the hardware store to find tackle boxes well suited for storing beads and beading tools. Consider the beaders preferred work habits, do they like to take their beadwork on the road, work from home, organize by color? You are sure to find lots of interesting options and this is another idea that is easy to fit into a budget. A bead spinner is just like it sounds - a device that spins beads. It consists of a spinning bowl, a base and a special needle that is used to pick up the beads while the bowl is spinning. The needle has a curve that makes it easy to hook the beads as they spin by. A bead spinner uses centrifical force to move the beads to the outside of the spinning bowl where they latch on to the curved end of the needle and slide up the thread. A bead spinner is a huge time saver for anyone that strings seed beads either to make strung jewelry or do bead crochet or kumihimo - both of which require the beads be pre-strung before you start working with them. There are electric and manual bead spinners. Many people prefer the manual ones because even though there is a little effort involved to keep them spinning, they are quieter. You can also buy extra spin bowls - a nice feature to keep the strining moving along quickly when multiple colors are needed. Prices range from $15 - $30. I recommend the ones with the wooden bowls - and a mini size one is perfect for starting out. Having excellent lighting is so important to making beading enjoyable. It’s difficult to have a good time or relax when you can’t see what you’re doing or constantly getting headaches from poor lighting. Or worse yet, when the bead colors don't go together as well as you expected when you bring your project into daylight. OttLite to the rescue! OttLite lamps have a full spectrum white light bulb that simulates natural daylight. It reduces eye strain, allows you to see true colors, is brighter than ordinary light bulbs and comes in a variety of lamp styles and sizes that are designed with crafters in mind. OttLites make a great gift and you can, but don't have to, break the bank. They range in price from $30 up to over $130, and with dozens of different sizes and styles, you’re sure to find a perfect match to your budget and any décor! Of course, beads are always a perfect gift. But have you considered giving vintage jewelry - as in your old unworn beads or broken jewelry? Granted, some people may consider used an insult, but to the right person, it's gold! Your trash may be their treasure if it contains glass or semi-precious stones, nice chain that can be re-purposed, pendants or even special clasps or earring findings in good condition. If you prefer to shop for new beads, a stunning, one of a kind focal bead or a unique strand of handmade lampwork beads make a wonderful gift. You can also purchase a gift certificate or gift card to the recipient's favorite bead store or online catalog. A strand of vintage nailheads or a new selection of seed beads in an unusual color palette is sure to inspire and excite. Whatever the occasion, beads are always a perfect gift.